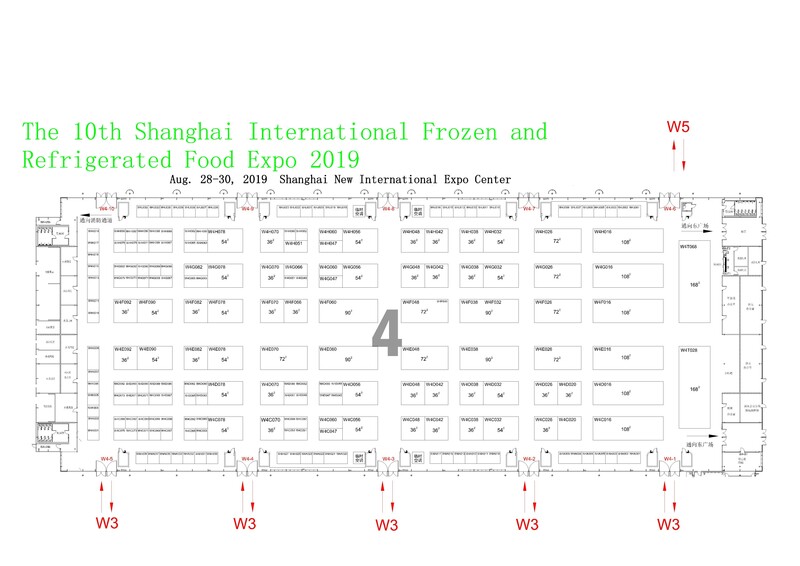 2018 Shanghai Global High-Quality Frozen Food Expo Open on 29th August! The 9th Shanghai International Frozen and Chilled Food ExpoFrozen and Chilled Food Expo(SIFCE)Frozen and Chilled Food Expo(SIFCE) undertaken by Shanghai ITE Gehua Exhibition Service Co., Ltd. and jointly sponsored by Shanghai Restaurants Cuisine Association, Shanghai Frozen Food Association, Condiments and Food Ingredients Committee of Shanghai Food Association, Shanghai Society of Microbiology, ITE Asia Exhibitions Limited and Shanghai Gehua Exhibition Planning Co., Ltd. had its brand opening in Shanghai New International Expo Center on August 29, 2018. After nine years of accumulation, SIFCE has not only realized the continuous expansion of scale, but also attracted source manufacturers beyond traders, and bulk buyers beyond small buyers. This year, the exhibition covered an area of 60,000 square meters and attracted 1,500 exhibitors from all over the world. More than 55,000 visitors are expected to witness the new level of China food shanghai. At ten o'clock in the morning, guests from national and local governments, provincial and municipal trade associations and consular representatives from multiple countries were all seated in audience’s expectations. Mr. Tian Quanhai, Chairman of China Aquatic Production Chamber of Commerce, Mr. Shen Siming, Chairman of Shanghai Restaurants Cuisine Association, Mr. Luan Yuxuan, Director of Dalian City Oceanic and Fishery Administration, Mr. Zhang Jiaming, Deputy Secretary-General of Peking Duck Working Committee of China Animal Agriculture Association, Ms. Victoria Braathen, Director of Norwegian Seafood Council, and Mr. Gordon, Regional Director of ITE Asia Exhibitions Limited delivered the opening speeches, and extended good wishes for the successful hosting of SHICAI. Then, Mr. Han Youheng, Executive Director of Shanghai ITE Gehua Exhibition Service Co., Ltd., announced the official opening of SHICAI at the opening ceremony and led guests to visit the exhibition after the opening ceremony. This exhibition, jointly with the The 9th Shanghai International Catering and Ingredients Exhibition, Shanghai International Restaurant & Catering Show 2018, the 7th Shanghai International Condiments & Food Ingredients Exhibition and Shanghai Catering Chain Franchise and Digital Management Exhibition 2018, with exhibits ranging from the source to the dining table, from raw materials to finished products, and from food ingredients to related equipment, provided numerous buyers of food materials with one high-quality and high-efficiency brand event. Comprehensive W5 Meat Hall accommodated exhibitors from a number of provinces and municipalities across the country, such as Inner Mongolia Aufaly Food Co., Ltd.,, Inner Mongolia Caoyuan Xinhe Food Co., Ltd., Ausaia, Shandong Grasshome Halal Food Co., Ltd., Shanxi Shuomei Mutton Co., Ltd., He’nan Meishi Food Co., Ltd., Yangxin Huayang Group Co., Ltd., Haopin Food Co., Ltd. of Dachang Hui Autonomous County, Luoyang CP Food Co., Ltd., Chengdu CP Food Co., Ltd., Ecolovo Technology Co., Ltd, Shanghai Lianhao Food Co., Ltd., Beijing Golden Star Duck Co., Ltd., He’nan Huaying Agricultural Development Co., Ltd., Shandong Chunxue Food Co., Ltd., Shandong Qihui Food Co., Ltd., Jiangsu Food Group Co., Ltd. and other leading enterprises, exhibiting beef, mutton, poultry as well as other raw materials and their products. The frozen food and special ingredients for restaurants were mainly distributed in W4 Hall, covering Xiamen Chenji Le Yaoju, Xiamen Gulong Food, Foshan Pingrong Food, He’nan Yunhe Food, Ji’nan Kangfa Food, Xiamen Lvjin Food, Hu’nan Zhangzhongshao, Sanquan Food, Shanghai Suweixuan, Shanghai Chipeng Food, Guangzhou Haocaiyao Food Production Co., Ltd. et al. which provides one-stop purchasing service of frozen food. In addition, the Special Area for Hotpot Food Materials in W4 Hall presented a big attraction of SHICAI such as Sichuan enterprises such as Chongqing Juhui Food Co., Ltd., Sichuan Red Lantern Food Co., Ltd., Chengdu Sheng’en Food Co., Ltd. and Chengdu Xinhongwang Co., Ltd. as well as well-known companies in the industry such as Wuxi Anjing Food Co., Ltd., Haixin Foods Co., Ltd., Chongqing Liuyishou Hotpot, Maocao Doulao, Yihai Food Co., Ltd. and Fujian Chunji Food Co., Ltd. The exhibition attracted a higher proportion than ever of condiments exhibitors all over the years, covering various Chinese and western condiments and compound flavorings. So many exhibitors such as Angel Yeast, Dalian Jinkui, Shanghai Otsuka Food, Zhongke Fengxiang Biotechnology Co., Ltd., Guangzhou Qianyi Bioscience Co., Ltd., Shanghai House Foods, Shanghai Qiancai Food Co., Ltd., He’nan Debang Food Co., Ltd., Beijing Hongguo Shidai and Dalian Zhongye Food Co., Ltd. presented us with an extremely rich variety of condiments. The food machinery and equipment was mainly distributed in W3 Hall, mainly covering production, processing, refrigeration and packaging products, represented by exhibitors such as Hebei Xiaojin Machinery Manufacturing Co. Ltd., Beijing Domine Machinery Equipment Co. Ltd., Shijiazhuang Helper Food Machinery Co. Ltd., Praxair, Cryogenic (Jiangsu), Shanghai Huixiang Machine, Zhejiang Utien Pack and Zhejiang Reador Machinery. In addition, the Chain Franchise Area accommodated Meituan, Chengde Picky Cat, Hangzhou Qianzun Food, Aixia Aixia, etc. In addition, the 14th Shanghai International Fisheries and Seafood Exhibition was co-located, which attracted not only domestic leading enterprise of aquatic products such as Jiangsu Cereals, Oils & Foodstuffs I/E Group Corp, Universal Aquatic Products Co., Ltd., Shunxin Fishery, Zhanjiang Guolian Aquatic Products Co., Ltd., Zhangzidao Group Co. Ltd. (ZONECO), Shandong Shipping Corporation, Hengxing Group, Shanghai Hydraulic Engineering Group Co., Ltd., CPTI Group, Dalian Tianzheng and Dalian Fugu Group, but also exhibition groups from many other countries such as Canada, New Zealand, Australia, Ecuador, South Korea, Thailand, Myanmar, Pakistan, Iceland, Spain, Ireland, Vietnam, Norway, the Netherlands and Denmark which displayed high-quality international aquatic products. Forum on Imported Beef and Catering Supply Chain, A Bite of Seafood - Promotion and Tasting of Dalian Aquatic Products, and the First Roundtable Development Summit Forum of Salmon Industry and Selection and Prize Presentation of Excellent Supplier on the afternoon of August 29 co-organized by SHICAI and Meat International Group. Promotion and Tasting of Norwegian Aquatic Products and Ecuadorian White Shrimp as well as Technical Forum on Condiments held in Comprehensive Activity Area of W3 Hall on August 20. As the annual gathering for the catering industry, this year’s event was enthusiastically received by guests and exhibitionists. It is believed that this expo will bring countless opportunities for the development of the catering industry, promotion of investment, and trade talks.